➧ Acrylic fabrics are very elegant & available in vibrant color stripes having width of 1.22m which are stitch able & water resistant. 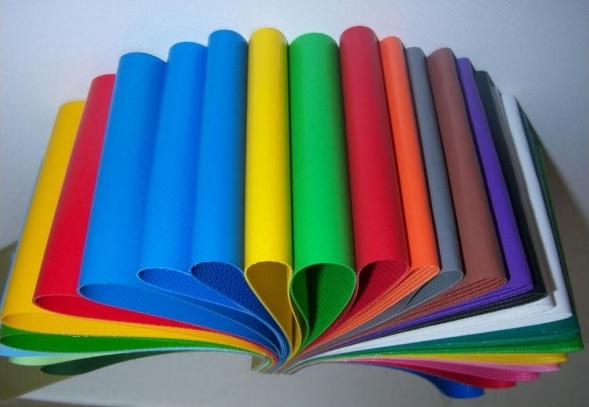 ➧ Laminated PVC fabrics having PVC films laminated on both sides of the polyester fabric. As the film is thin the fabric is quite light weight. This fabric is very economical having a life of approx. 2 to 3 years and is available in a width of 1.52m. ➧ Double side coated PVC fabrics are 100% waterproof available in various stripe combination and plain colors. These fabrics are available in widths of 1.22m, 1.52m, 1.82 & 2.42m. These fabrics are made by various Indian, European, Asian companies. Depending on the make & quality these fabrics have a life of 5 to 10 years. ➧ Tensile PVC fabrics made mainly by European companies in Belgium & Germany are available in various thicknesses as required for different project sizes. The only color available is white. Depending on the top coat of acrylic or PVDF the life of the fabric various between 10 to 20 years. ➧ Tensile net fabric made by an Australian company is available in various colors having a width of 1.5m having very good tensile properties. This fabric is porous & hence not water proof but allows hot air to escape thus making it an ideal fabric for areas where water penetration is not an issue. ➧ Shade net fabrics as the name suggests is not waterproof, is made by many Indian companies in 3m widths in many colors & stripes. These fabrics not being dimensionally stable elongate a lot, but as they are cheap they are ideal for covering of temporary structures which do not need waterproofing.